Hosts Cameroon today pipped Ghana 1-0 to advance to their fourth women’s AFCON final on Saturday in Yaounde. They await the winners of the second semi-final between Nigeria and South Africa for the championship game. The match winner for Cameroon was Raissa Feudjio, who smashed home from a goalmouth scramble after 72 minutes. 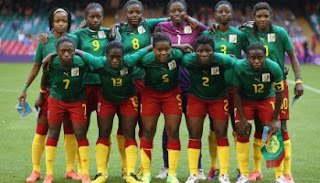 Cameroon were the better team, they created more chances in their search for the opening goal and deserved their victory as the Black Queens soaked the pressure for most of this contest. On Saturday in front of their own fans the Lionesses will hope to extend their winning streak at this tournament by winning their first final after losing their previous three finals. Two years ago, they lost 2-0 to Nigeria in the final in Namibia.